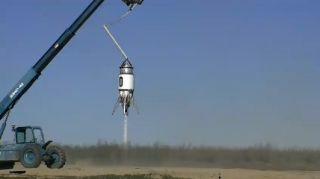 The suborbital Xaero launch vehicle built by Masten Space Systems performs a tethered flight test on Feb. 21, 2011 in this still from a video by Masten officials. NASA has named its first four experiments to fly on suborbital missions by private spaceships, as part of the agency's bid to encourage the development of commercial spaceflight. The four payloads will fly on two different reusable suborbital spacecraft: the Xaero, built by Masten Space Systems, and Armadillo Aerospace's Super Mod vehicle. These two spaceships are scheduled to make test flights at various times throughout 2011, and the experiments will be aboard during those launches. "This really is great news for the commercial suborbital industry, and for the research community as well," said Alan Stern, associate vice president at the Southwest Research Institute (SwRI), a non-profit research organization based in San Antonio. SwRI has inked its own deals to fly research missions aboard suborbital craft operated by Virgin Galactic and XCOR Aerospace, possibly beginning in 2013. "Investigation to Determine Rotational Stability of On-Orbit Propellant Storage and Transfer Systems Undergoing Operational Fuel Transfer Scenarios" from Embry-Riddle Aeronautical University, Daytona Beach, Fla.; NASA's Kennedy Space Center, Fla.; and United Launch Alliance, Centennial, Colo.
"Printing the Space Future" from Made In Space Inc., Moffett Field, Calif.
"Electromagnetic Field Measurements on Suborbital Launch Vehicles" from Johns Hopkins University's Applied Physics Lab, Laurel, Md. "Precision Landing Exploration Technology (PLANET) Demonstration" from Charles Stark Draper Laboratory, Inc., Cambridge, Ma., and NASA's Johnson Space Center, Houston. These last two, along with 12 other payloads, were also chosen to fly on parabolic aircraft flights, which can provide brief periods of microgravity. The parabolic flights will use a plane operated by the Virginia-based Zero-G Corporation and take place during a weeklong campaign in mid-July, NASA officials said. "Through our Flight Opportunities Program, NASA is able to align research and technology payloads with commercially available flights to mature technologies that will benefit America's future in space," said NASA's chief technologist Bobby Braun. "This program allows researchers, technologists and innovators to help NASA meet our future mission needs while infusing new knowledge and capabilities into our nation's universities, laboratories and space industry." NASA will continue to accept Flight Opportunities Program proposals until Dec. 31, 2014, agency officials said.